Some of the best recipes are those that take very little effort. That is very true with this Oatmeal Raisin Cookie Snack Mix. 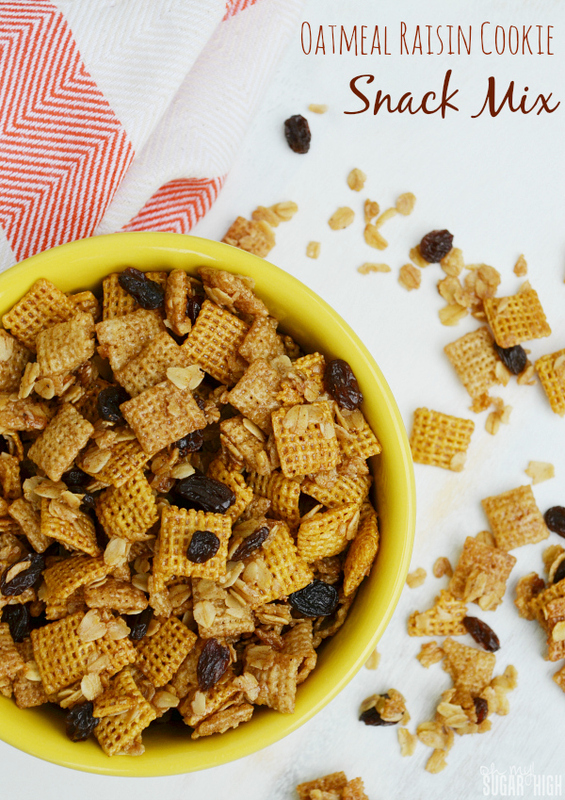 When you are craving cookies but just can’t spend the time in the kitchen, or simply don’t want to turn your oven on, this snack mix is perfect for satisfying your cookie craving. 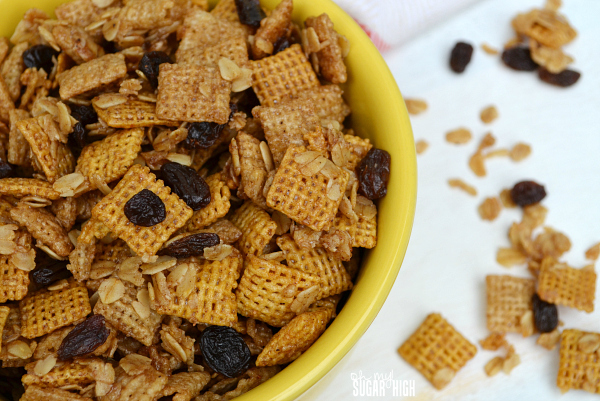 I spied this tasty Oatmeal Raisin Cookie Chex Mix recipe and knew I had to try it. I didn’t have the recommended varieties of Chex, but that is the beauty of snack mix. It doesn’t have to be the exact same as long as you have a good substitute. I had rice and corn Chex on hand from another snack mix recipe so I just altered a few of the ingredients to for a similar taste. And even better, because I’m using rice and corn varieties of Chex, this recipe is gluten-free as long as you are using pure, uncontaminated oats. I also love raisins, so I added some extra in. 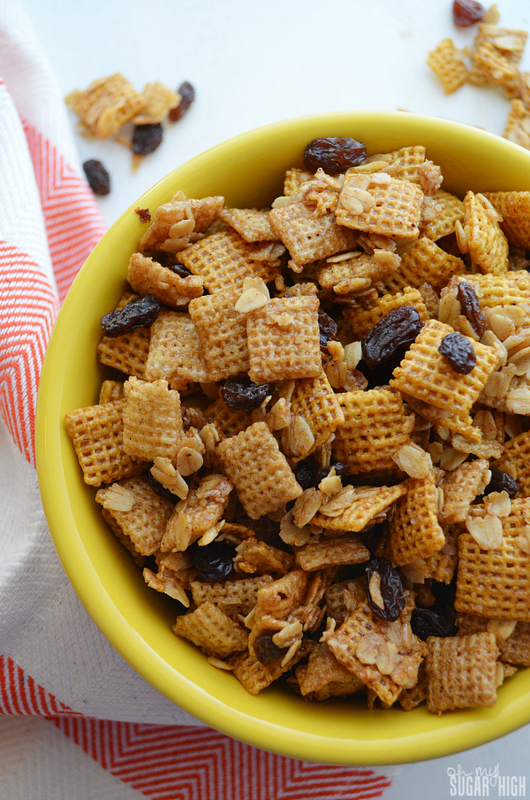 You’ll be surprised just how much this snack mix tastes like an actual oatmeal raisin cookie. My husband couldn’t believe it. And much like when I make cookies, he was hooked. Mix together cereal and oats in a large microwaveable bowl. In small bowl or 2 cup measuring cup (make sure it is microwavable), microwave butter on high until melted. (Approximately 30 seconds.) Add in brown sugar, corn syrup, honey, cinnamon and nutmeg. Microwave uncovered on high 30 seconds, or until boiling. Pour butter mixture over cereal mixture. Mix gently until evenly coated. Microwave cereal mixture uncovered on high for 3 minutes, stirring every minute. Stir in raisins. Microwave another minute. Pour cereal mixture over line baking baking sheet. Spread out and cool completely. Store in tightly covered container. What a great idea! I love chex mix and this would be something different than just the normal one. I also like the fact that it has oats in it for some extra fiber. Thanks for the recipe – pinned. This looks DELICIOUS!! I love these addicting snack mixes. Cannot wait to try!